Russian propaganda keeps churning out brazen disinformation about current events in Russia, Ukraine and the West. Since Edward Snowden’s representatives are reportedly negotiating a deal that would allow him to return to the United States, Russian propagandists decided to use his name with a sinister motive. Putin’s regime is producing multiple conspiracy theories about the recent murder of Boris Nemtsov – Russia’s former Deputy Prime Minister and a prominent Russian opposition leader. The most obvious motive is quite clear: Nemtsov was a prolific critic of Vladimir Putin, who compiled thorough reports and made public statements about the corruption of Putin’s kleptocracy. Nemtsov’s latest project was to exposethe open secret of Russia’s troops covertly fighting in Ukraine. The Kremlin’s propaganda machine is explicitly avoiding any discussions about the real motives behind the long string of deaths of those who dared to criticize Russia’s autocratic leader. Instead, Russian propagandists are promulgating tall tales that disingenously attempt to pin the blame on Islamic extremists, romantic jealousy and the U.S. Department of State. Putin’s close friend and ally, the Head of the Chechen Republic Ramzan Kadyrov posted a message on his Instagram page with over 848,000 followers, attributing the following quote to Edward Snowden: “They started to eliminate those, whom they have fed for many years. They don’t need those who couldn’t accomplish their plans and those who know their secrets. State Department won’t stop with Nemtsov, they will go further.” Kadyrov did not provide the source of this preposterous statement. Snowden did not post or otherwise disseminate any such allegations through any of his usual means of public communication. On its face, the quote appears to be completely fabricated. Another fabrication of Russian propaganda was prominently featured in their mainstream media. 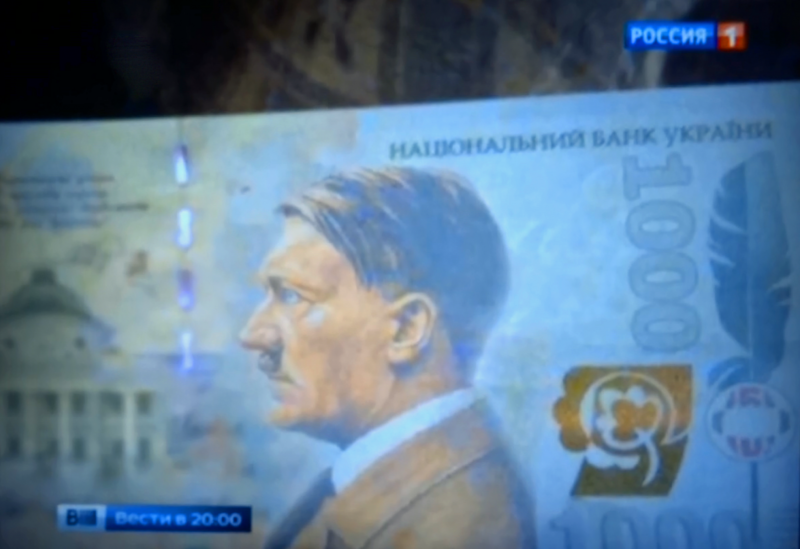 State-owned television channel Rossiya-1 claimed that Ukraine’s party “Svoboda” is proposing to feature Adolf Hitler on Ukraine’s currency, hryvnia. The clip also compared Ukrainian Prime Minister Arseniy Yatseniuk to Heinrich Himmler and aligned his political reasoning with that of the Third Reich. This allegation is also without any basis, since neither “Svoboda,” nor any of Ukraine’s parties or political leaders have ever brought forth such an offensive proposal. It should be noted that Russia is modifying its propaganda methods. The use of pre-existing photos and videos in the Kremlin’s ongoing disinformation campaign against Ukraine is easily and frequently debunked. Therefore, Putin’s propagandists are increasingly resorting to outlandish fabrications – from Sasha Grey to Adolf Hitler and Edward Snowden.